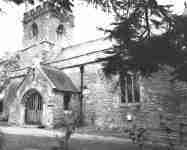 The church is predominantly 13th century (1200 AD), with 11th century pillars and added north and south transepts. The church was re-ordered in 1974, in the early days of Milton Keynes. Although this has taken away some of the furniture usually associated with a Parish Church, it does give the visitor the experience of a church that has been successfully adapted to suit the needs of the modern congregation it serves. We use aspects of the church's history, whilst aware of the work that we do today as St Mary's congregation. At the entrance to the church is a beautiful Victorian Lych Gate. The lych gate opened the way for babies to be brought for baptism and was also where the villagers would be laid out in anticipation of their burial. It bears a memorial to those villagers who served in the Great War. The Font is Saxon, with a beautiful Victorian wooden counter-weighted cover. During the Civil War, items such as the font were removed, but ours managed to stay in the church. The Font is in this position near the door to remind us of the beginnings of the Christian journey. The Millenium Banner, designed by Kim Porter, uses different scenes to show the work of our church in the community and throughout the world. Members of the church took a subject and then it was all united together. Also notice the Stone Piscina and Wooden Eagle. The Piscina is evidence of an old chapel in this part of the church, as this is where the priest would prepare for Communion. The eagle is from a lectern that was once used in the church. The wonderful organ, installed by his family as a memorial to Colonel Levi, who lived in the house next door, completed its work in 1991 and the area has now been converted into a welcome and refreshment area. A much older Rood Screen used to exist in the church. You can still see evidence of it by the door that opens up at the top right. Psalms would have been chanted from the top. Steps in the side show how the door was reached - and also how small the villagers were then! The Chancel Step is the area where God meets the people by means of his word - the pulpit is Victorian, as is the Rood (cross) Screen which traditionally separated the Nave (people) from the Chancel (priests). The choir would sing in the Chancel and the priest celebrate the Holy Communion. We have many memorial tablets (particularly to past vicars!) and the Monkston tomb, dating from the fourteenth century. The Church faces East to remind us of the sunrise on Easter Sunday. Stained glass was used to tell bible truths in churches before most people could read. On the outside wall of the East Window, the wall is slowly being eroded by an unusual predator - mortar bees! The Nave is where the people sit. It was built between 1200-1300 around pillars that are even older. In Medieval times, this area would have served as market place, meeting place and worship place in one - pews were a Victorian addition. Notice on each pillar is a red cross. At the back of the church is the Ringing Chamber. Above it, on the south side is a coat of arms from Charles II. And either side of the doors are tablets containing the Ten Commandments - these would have been introduced, probably at the front of the church, during the Commonwealth (1648-1660) when a new reverence for the God's world came to light. The Tower, rises to a height of 60 feet above the ground. Six bells are housed in the chamber, the earliest dating from 1743. Bell-ringing practice is on a Thursday evening. Out in the Churchyard we have graves of the Levi family who lived next door in what is now the Parkside Hotel and of many other village families. From here you can get a good view of the wonderful and well-kept churchyard that we have, with many fine images and carvings.